Just had to mention that yesterday was my highest day so far with 115 hits, as measured by the great WordPress people. My highest day had previously been 75 hits and that was a while ago. Now, if I only knew how to keep this up! Macon, Georgia is a town with a lot of history, but many of the residents of Middle Georgia don’t get to experience it. The interstate veers people away, and years of negative talk about crime have also kept people back. I’ve posted before about the work being done at the Fountain on Third and Cherry Street in Macon for the homeless. It is a wonderful avenue for people to become engaged in helping their neighbor, but also in seeing the beauty of Downtown Macon. I just came back from a visit to downtown and met several people who were knowledgeable about the area. The Macon-Bibb County Convention and Visitors Center is a great place to go to get maps and information about things that may be happening in or around downtown. One of the places I spent some time was at the Sochi Gallery. They were having a First Friday showing, so I went to check it out. It’s a great little gallery that immediately take you off the street and into a serene space. If you have time go check it out, you’ll love it. One of my most favorite holiday traditions is watching the lighting of the Rockefeller Center Christmas Tree. After the Macy’s Thanksgiving Parade, the tree lighting is another step closer to Christmas. Maybe I’m nostalgic, but I like to do a few things year after year, and also keep an eye out for things that can become traditions. For instance this year I found out that my youngest, at age 8, was enthralled with the debates and election coverage. So in 3 or 4 more years we’ll do it again. This year the kids did the tree themselves (except for a couple on the higher branches). They had a blast and we weeded out some of those fragile balls that you can worry about being broke – no more worries for us! Loving this time of year; loving experiencing all the sights and sounds of the city and the neighborhood! I really do think “it’s the most wonderful time of the year”. I think that Twitter is something that you either get or just think it’s nonsense. I’ve been both. The idea that anyone would actually want to follow my moves throughout the day was not only ludicrous, but also a little scary. I mean really, it’s like giving people an easy way to stalk you. However, the more I keep researching the concepts of social interaction and connection, I see that this is just what we need. The big question is, “Do I want/need to Twitter? I haven’t come to any solid conclusions so I thought I would throw the question out to you. What do you think? I’ve already drank the Facebook Kool-Aid, so why not Twitter too? Yes, I’m a Halloween baby. For years and years you’ve celebrated my birthday unknowingly. For those who didn’t know, some questions they’ve had have now been answered! Sometimes we have birthdays that are good and others that are bad, but today has been a great day for me. I woke up this morning and had dozens of birthday wishes on Facebook, then I had several people call and then topped it off by meeting at the Holton’s house for trick-or-treating and some good time together (there was also a cake and some good punch!). So much as happened over the past year to be grateful for, that there simply isn’t enough time or space. Most of it boils down to good times with good friends and being able to be myself. For years I tried to fit into a mold that was made by other people, that was difficult and stressful. The transition to being yourself may be hard, but the “being” yourself part is an indescribably simpler way to live. My friends and I may not agree on everything (we don’t for the record), but the thing we do agree on is that we are friends. Being connected with people in an organic way seems to be the antidote for most of the stressful junk that most of us wade through each day. When I think of people I want to hang out with or talk to I think of the people who are a part of Lifepoint. The best birthday present of all is to know that true friends are just a phone call away – in fact sometimes they have called before I did! This next year is certainly going to have some new stuff in it. There will be new economic, political and financial events, but in each of the different experiences awaiting in the following year, I know I’ve got people who care for me, and who I care for, that will be sharing in the experiences with me. OK, had to post about this great game between UGA and LSU. Both are great teams; both are great SEC teams; and both really wanted to win this game. By far, the most memorable moment was right after one of the commentators proclaimed that Matthew Stafford could not give the ballto Knowshon Moreno. If Stafford did give the ball to Moreneo, LSU’s defense would stop him. The words had no more left his mouth than Matthew gave the ball to Knowshon and Moreno ran through LSU’s defense down the field. The score was high on both sides. 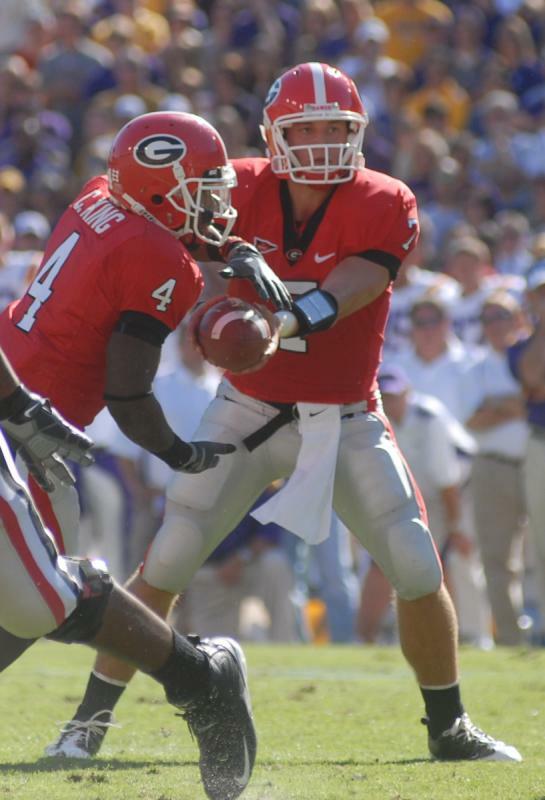 Georgia scored more that they had ever scored in a game at LSU. To be fair, LSU’s red-shirt freshman quarterback Lee did a good job in keeping momentum when he was playing as quarterback. This was a great game to watch. I particularly liked watching Matthew Stafford. He showed just how good he can be. Incredible arm, aim and focus. In spite of the fact that a good number of LSU fans were in the parking lot on the way home, the game ended with just as much enthusiasm from both teams players as it had begun with. All said and done, another great Saturday of college football in Georgia!